Formulation: Liquid. In 40mM TRIS-HCl, pH 8.0, containing 110mM NaCl, 2.2mM KCl, 0.04% Tween-20, 80ng/µl MDYKDDDDK peptide, and 20% glycerol. Application Notes: For use in ubiquitin and FAT10 protein modification studies. Use/Stability: Stable for at least 6 months after receipt when stored at -80ºC. Scientific Background: UBA6 (ubiquitin-like modifier activating enzyme-6, also known as UbE1L2) is a novel ubiquitin activating enzyme that is also capable of activating the ubiquitin-like protein FAT10 (human leukocyte antigen F-associated transcript 10), which, similarly to ubiquitin, may serve as a signal for proteasomal degradation. 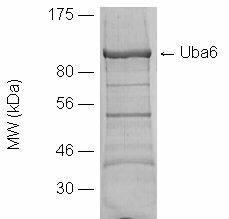 UBA6 exhibits 42% homology to the major ubiquitin activating enzyme UbE1 and contains all the key structural elements required for E1 enzyme activity. It has been shown to interact with a number of E2 and E3 enzymes, facilitating transfer of ubiquitin to substrate proteins such as p53 in vitro. Only one UBA6 specific E2 conjugating enzyme, known as Use1 or UbE2Z, which is capable of accepting activated FAT10, has been identified to date. FAT10, is encoded by the major histocompatibility (MHC) class I locus, and its expression is induced by tumor necrosis factor α (TNFα) and interferon-γ (IFNγ). FAT10 is highly upregulated in hepatocellular carcinoma as well as in other gastrointestinal and gynecological cancers, though its precise biochemical and cellular functions have yet to be determined. FAT10 forms covalent conjugates with cellular proteins through its C-terminal diglycine motif, though substrates have yet to be identified. Knockdown of Uba6 results in strong, but not complete diminution of FAT10 conjugation, an effect not observed with knockdown of UbE1. This finding indicates that Uba6 is both necessary and sufficient to activate FAT10 and thereby facilitate its conjugation. 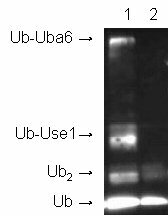 Western blot of ubiquitin thioester assay showing Ub activation by Uba6 (BML-UW0350) and conjugation by Use1 in the presence (1) or absence (2) of Mg-ATP. Ubiquitin species detected using ubiquitin antibody BML-UG9510 at 1:1000 dilution. SDS-PAGE image of Uba6 (3µg, BML-UW0350), coomassie stained. Western blot of FAT10 thioester assay showing HA-FAT10 activation by Uba6 (BML-UW0350, 1-2) and conjugation by Use1 (3-4) in the absence (1,3) or presence (2,4) of Mg-ATP. Species of interest detected using either Uba6 antibody (BML-PW0525, 1-2) or anti-HA (3-4) at 1:1000 dilution.